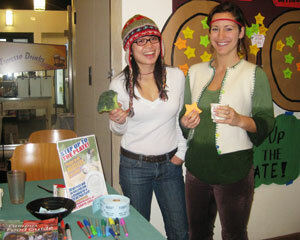 Students advocated for vegetarian dining at a recent Meatless Monday at Crown. A poster promoting Dining Services' meat-free meals campaign. Not so long ago on college campuses, vegetarian cafeteria food was synonymous with "boring." Selections were grim and unimaginative. Organic produce, if you could find it at all, looked like it had been left out in the fields too long. Now organic and sustainable foods have gone mainstream, and UC Santa Cruz has embraced the "Meatless Mondays" dining trend, which is sweeping through learning institutions from elementary to graduate schools. Meatless Mondays pioneers include UC Davis, Yale University, and Baltimore City Schools. "Everyone in the feeding business is involved in a revolution," said Candy Berlin, program coordinator for dining. At first, plant-based meal nights were special events at UCSC, starting in early 2008. But this food "revolution" took hold during the 2009 Summer Orientation meal, served to more than 5,000 new UCSC students and their families. Then came the Office of Physical Education, Recreation & Sports (OPERS) Fest in the fall, featuring a "Real Food" menu designed to introduce students to plant-based local and organic dining without processed ingredients. These meals were well-received at a campus that has long been associated with the sustainable food movement, in large part because of "the Farm," UCSC's agroecology training and research center. These menus, which focus on lower-carbon footprint dining, are part of a larger trend that includes local organics and direct, fair-trade coffees. Now, the Meatless Monday Dinners have grown into once-a-week events. 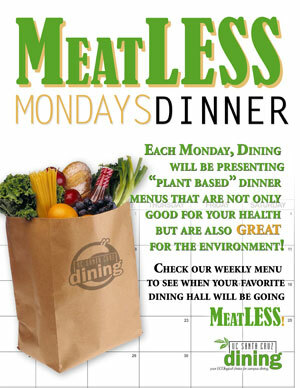 Vegans and vegetarians, or omnivores who want to cut down on their meat intake, can follow Meatless Monday Dinner or Beefless Days around from dining hall to dining hall. Now there is talk of stepping up the meatless events to two dining halls per week, said Berlin, who assists with planning these events. "When you have 7,000 meal plan holders, you have to take baby steps," she said. "We don't want to alienate students." So far the student feedback has been encouraging, for the most part. "We have had some very interesting comments," Berlin said. "Eighty percent were very positive--'We loved it, do more'--and 20 percent said, 'Where's the beef, I pay a lot of money, we shouldn't be forced to go without the beef.'" "But we aren't forcing anyone to go without the beef," Berlin explained. "If you want the beef, you just have to choose a different dining hall." At a recent Meatless Monday night at the Porter/Kresge Dining Hall, most students gobbled their tempura veggies, black bean and portobello chilaquiles, pesto cheese pizza, and lasagna blanco with apparent relish. "I'm fine with it," said Eduardo Mercado, 19, a psychology major and Porter resident, while sitting down to his Meatless Monday dinner. Mercado is omnivorous, but he had no problem with the meatless spread. "If I do eat meat, it's mostly on sandwiches anyway, and I'll always eat anything with mushrooms in it." That night, the emphasis seemed to be on comfort food, sustainability and transparency when it came to the ingredients. Several entrees had nutrition information displayed in front of the food. For instance, the chilaquiles had 429 calories per serving, with 24.4 grams of fat, 29.4 milligrams of cholesterol, and 883.8 milligrams of sodium. Alexis Padilla, 18, who lives in Porter and is an art major, enjoyed the options. "To be honest, I didn't even notice that it was Meatless Monday," she said. "I never went for meat anyway, not even when I was a baby." Padilla praised the vegetarian options she's had on campus, especially an Indian dish she ate recently. She says she hasn't heard complaints about the increased emphasis on vegetarian dining. "Santa Cruz is a pretty liberal place anyhow," Padilla said. "Other campuses might have more of an issue with this." Scott Berlin, the Food Service Director, has also received some feedback from students who thought that a meatless day was a cost-cutting measure, due to the fact that vegetarian ingredients can be less expensive than meat. "But that's not necessarily so," Candy Berlin said. "Experimenting with a menu can be costly, and meat alternatives are not necessarily cheaper. Meat substitutes can be tricky to work with in terms of yield, or they can break down too fast. What you thought would work in recipe might not." Besides, food preparers must work on an epic scale. The campus food service prepares more than 20,000 meals per day. Much of the organic campus produce comes from Agriculture and Land-Based Training Association (ALBA), based in the Salinas Valley. Berlin estimated that 20 percent of all produce served on campus is organic, and of that, 65 percent comes from local sources.